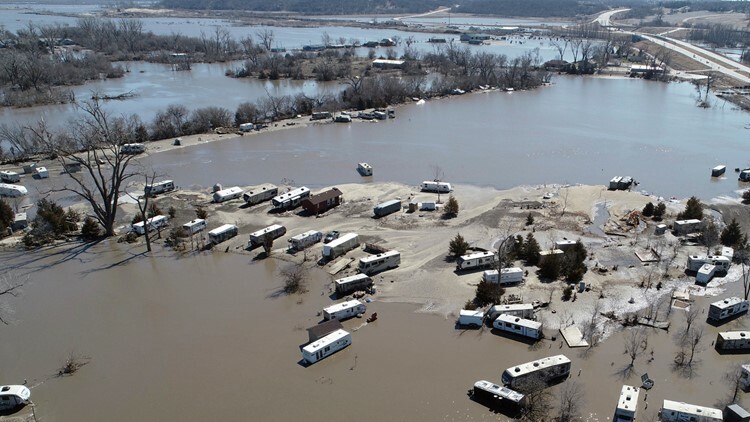 Flooding has claimed three lives, damaged thousands of homes and busted about 20 levees in Nebraska, Iowa and Missouri. This Wednesday, March 20, 2019 aerial photo shows flooding near the Platte River in in Plattsmouth, Neb., south of Omaha. The flooding has also taken a heavy toll on agriculture,inundating tens of thousands of acres, threatening stockpiled grain and killing livestock. Nebraska's governor said his state has suffered nearly $1.4 billion in estimated losses and damage, including $840 million in crop and cattle losses.